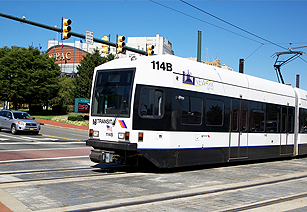 ISR was selected to assist NJ Transit with a Fiber Optic Redesign for their Light Rail Systems after Hurricane Sandy Damage? • RF Expert Reports on Topics Such As 220 MHz RF Designs, Comparison of IVDS/AMTS/220 MHz Spectrum Bands, Understanding Signal-to-Noise Ratio, etc. ISR is part of a team providing communications engineering support to New Jersey Transit (NJT) for the implementation and deployment of its Positive Train Control (PTC) solution, Advanced Speed Enforcement System (ASES II), including assurance of interoperability with Amtrak and other rail operators in the NJT service area (including parts of New York and Pennsylvania). During the first phase of this multi-year support, ISR has performed a preliminary RF Spectrum Analysis (RFSA) within the 217 - 222 MHz spectrum band, to identify available spectrum that can be used for the deployment of ASES II on all NJT commuter rail lines. In addition to the RFSA, ISR performed a Preliminary Coverage Analysis of NJT lines using information from the Amtrak Data Radio Specification. ISR is acting as NJT’s Procurement Agent for radio spectrum, contacting spectrum owners on behalf of NJT to determine what spectrum they are willing to sell/lease, to request rough-order-of magnitude pricing for the sale/purchase of available spectrum, and to clarify any engineering questions regarding the spectrum NJT requires. ISR is providing NJT the basic information for a cost comparison of lease and/or purchase options, and will also explore the feasibility and benefit of sharing the RF acquisition cost with Amtrak, MTA Metro-North Railroad, and SEPTA. Additionally, ISR is performing a preliminary communications backhaul analysis for all NJT routes, including integration with NJT’s existing microwave backhaul system. This will cover existing routes and system expansion projects such as Portal Bridge, Bergen-Passaic line, and Northern Branch, to determine the network backhaul options (fiber, microwave, cellular networks, etc.) best suited to each route. , This will also cover other applications on NJT’s commuter lines, such as CCTV and PTC that could take advantage of this communications backbone.